No Reservations, rented campsites must be occupied. use of horse arena as per guidelines (unless previously reserved). Use of Ball Field (unless previously reserved). Use of horseshoe pits & playground area. Sani Dump: located in Creston just south of College of the Rockies, at 301-16th Ave. South. Please talk with our Park host for additional information, and we hope you enjoy your stay! Keep pets controlled, on a leash, and indoors during quiet times. Please clean up after pets. Quiet hours are 11pm to 7am. Use of generators is limited to 8-9:30am and 5-7pm. Please put all garbage in designated garbage containers. Alcohol is allowed only in designated campsites or licensed concessions. Horses are allowed only in riding arena and south end of the park. No ATV's, motor bikes, firearms, fireworks or hazardous materials permitted in park. Use, posession or distribution of illegal drugs in park will not be tolerated. Speed limit within park area is 10KM per hour. Campfire allowed in designated fire pit only and if there is no fire ban in effect. Campfire must be attended at all times. Camping is only allowed in one of the 14 numbered campsites at the northeast corner of the park. 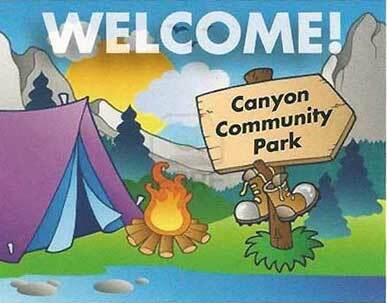 Campground check-ins is 2PM or later; check-out is at 12:00 noon. No more than one (1) sleeping unit and one (1) vehicle is allowed per site. Maximum four (2) adults per site. Showers are coin operated (loonies). Water is available from dishwashing station and standpipe north of ballfield bleachers.